Eggs are inexpensive, nutritious and delicious, and one of my favorite ways to enjoy them is in huevos rancheros. 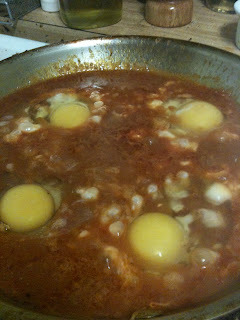 But the guerrilla gourmet has been in decidedly Italian territory lately, so we turned instead to uova ai purgatorio (eggs in purgatory) - a poetic name for eggs poached in tomato sauce. You can use any tomato-based sauce for this, but the rich, simple Ragu a la Napoletana makes for an expecially gutsy, rich experience. There's nothing "halfway" about it! What's Guerrilla: Eggs are cheap, and this recipe cooks them up with a minimum of fuss. What's Gourmet: Unctuous ragu with slightly oozy eggs make for a rich addition to polenta. I gather that back in the good old days, when food was important (and women stayed chained to the stove) every household had a stock pot that simmered away at the back of the stove all the time. A busy housewife would toss in all the the scraps and trimmings that a busy home kitchen produced, keep it topped up with water, and have good stock or broth on hand all the time! My solution after the jump. A16 Food+Wine is my favorite kind of cookbook. I could never afford to eat at Nate Appleman's restaurant, but his book doesn't skip on serious techniques and brings the humble, gutsy cuisine of Campagnia (the province including Naples) within reach of a talented amateur cook like myself. During this Lent experiment, I've found myself delving through the book and finding some very satisfying and surprisingly inexpensive dishes like Cavatelli a short, eggless pasta that's great with cauliflower, anchovy, and chiles; and onion and tomato paste soffrito that brings extra depth to earthy greens like kale. This week we're trying a rich Ragu a la Napoletana with another Campagnian noodle, maccarronara. Recipe follows after the jump!